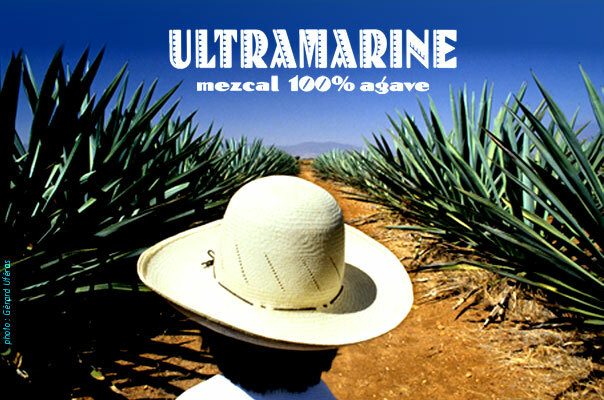 The Ultramarine mezcal, a Mexican traditional drink, is produced by distilling “mezcalero” agave grown in the State of Oaxaca. baked in an earthen oven, then crushed, let to ferment and distilled. After standing in oak casks for several months, the Ultramarine mezcal is bottled in Oaxaca, Mexico. Bottling in the state of origin is mandatory for all the mezcals. No bulk export. As of summer 2005, the State of Mexico controls the quality of mezcals. All bottles of Ultramarine mezcal include, at present, a worm ("guzano", in spanish). the 100% agave Ultramarine mezcal is an authentical mezcal of Oaxaca.